Performance Years Enterprises is proud to announce 4 new versions of the 1970 Plymouth Cuda’s. These are very desirable cars that hold a special place in the hearts of many Mopar enthusiasts because of the uniqueness & rarity of these cars..
PYE has commissioned Hwy 61 Collectibles to produce a very limited run of these cars along with a CHASE CAR VERSION of each color in 1/18th scale. These cars feature all of the cool details found on the Hwy 61 cars including, scissor type hood hinges, correct type door hinges, opening trunk, rotating drive shaft, movable sun visors, glove box door, front seats & seat backs, carpeted interiors, seat belts, plumbed & wired engines. Hood pins deleted, chrome rear view mirrors, the “Mod Top” decal in rear quarter glass window added, black steering wheel, “Mopar” batter decals added to top of battery, and a “Sure Grip” decal to the underside of the trunk lid. Extra paint details to the gas tank straps, undercarriage body plugs, all exhaust clamps, and engine overspray on the bell housing and automatic transmission. More paint detailing to the bumper jack, brake master cylinder and the windshield washer tank shows half full of solvent. The design guys at Chrysler were always on the visual cutting edge of promoting their products. For example: the High Impact colors and the bold racing stripe packages. Hoods with Shakers, Air Grabbers, Power Bulges and Scoops. The front & rear spoiler options or the sound of those engines exiting through the rear valance panels or the trumpets in front of the rear wheels. The list goes on & on. 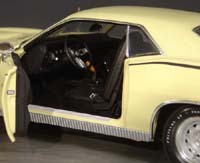 But, one of the most outrageous options was offered on the 1969 & 1970 Plymouths & Dodges, the MOD TOP Cars! This was a floral Flower Power pattern offered as an interior seat & door panel package or vinyl top. 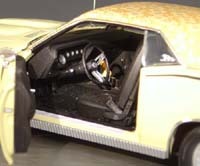 The cars could be ordered with the Mod Top interior or vinyl top only or with both. Dodge offered the 1969 Dart, Coronet & Super Bee. Plymouths offerings were the 1969 Satellite and 1969 & 1970 Barracuda’s & Cuda’s. Total production numbers for the 1969 & 1970 Barracuda’s & Cuda’s were approximately only 1021 cars. Only approximately 84 1970 Plymouths were produced. Everything from small blocks to a 440 has been documented and 4-speeds or automatics were available. MOD TOP Cuda’s retail for $69.95. The CHASE CAR & MOD TOP Cudas will be sold as a set for $149.95. These cars will be available first quarter of 2007. Please pre-order soon!